May 23 (New York) — Teachers are largely committed to their unions, but they also want them to better engage members and ensure their policy positions and priorities reflect the beliefs of their diverse memberships, according to the results from a new survey of teachers across the country. Voices from the Classroom: A Survey of America’s Educators is a ground-breaking, nationally representative survey written for teachers, by teachers, produced by the teacher-led organization Educators for Excellence (E4E). A decision is expected within the next few weeks from the U.S. Supreme Court on Janus v. AFSCME, a case regarding the right of labor unions to collect mandatory fees from nonunion members for services they are required to provide to all employees, including representation for wages and benefits, grievances and disciplinary matters. The Janus decision will have major implications for teachers unions’ future memberships and revenue, so E4E is sharing results now relating to this case and to teachers’ thoughts about unions more generally. The questions are part of the larger Voices from the Classroom survey of teachers about what’s working, what holds promise and what needs to be changed in their schools, districts, unions, states and at the federal level. E4E will release the full survey on Aug.1. Eighty-five percent of all teachers regard unions as essential or important, as do 74 percent of nonunion teachers. For current union members, a full 94 percent find the union to be essential or important. Without collective bargaining or a union, 86 percent of teachers believe the working conditions and salaries of teachers would be much worse, which is a nine percentage point increase since Education Sector’s 2012 Trending Toward Reform survey asked this same question. And, 85 percent of teachers believe that without unions, they would be vulnerable to school politics or administrators who abuse power. Meanwhile, only 22 percent of union and nonunion teachers feel it is important for unions to provide information about political candidates and their issue positions. Despite being the primary agent for teachers in policy decisions, 52 percent said their union represents their perspective only somewhat, while another 20 percent said that it did not very much or did not at all. Although they feel their unions are important, teachers’ engagement is relatively low with only about half of union members reporting that they voted in a union election (53 percent), spoke to a union representative (51 percent) or attended a union meeting (51 percent) in the past year. As of April 2018, 78 percent of all teachers had heard not much (21 percent) or nothing (57 percent) about the case. And, a full 47 percent of union members said they had heard nothing about the case. When asked if they would be likely to actively opt in to their union if they were not automatically enrolled, 82 percent said they would be likely to do so. But for nonunion members currently paying fair-share fees, six out of 10 would be likely to opt out of paying any fees. For more details on the national results, visit e4e.org/teachersurvey. E4E’s mission is to ensure that teachers have a leading voice in the policies that impact their students and profession. Even though policymakers at every level of the system are talking about teachers, they rarely are talking with teachers. 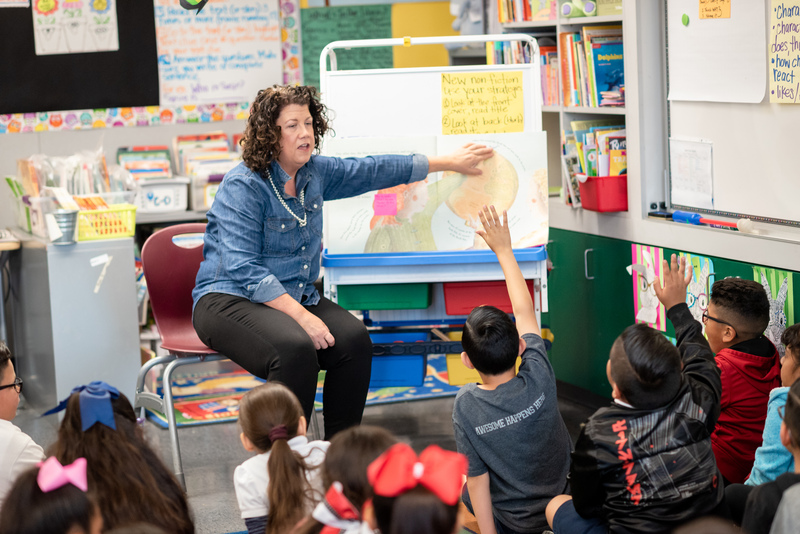 Voices from the Classroom: A Survey of America’s Educators captures crucial insight on the views and opinions of a representative sample of current public school teachers across the country on a wide variety of issues impacting their students and their profession. The full survey will be released on August 1. The survey was conducted online from April 14-May 6, 2018, among a nationally representative sample of 1,000 full-time traditional public school and public charter school teachers. The survey questionnaire was developed in consultation with Educators for Excellence member teachers from across the U.S. The survey instrument was written and administered by Gotham Research Group, an independent, New York-based research firm. Currently, all public sector workers have the right to opt out of joining a union. In some states, public sector unions have had the right to collect “fair share” fees from those who opt out in order to cover the cost of the services the union is required to provide to all employees. Unions can only use fair share fees for non-political activities, such as negotiating contracts, legal representation or speaking up on general policy issues like professional standards for teachers or access to educational resources for students. They cannot use these fees for political activities such as lobbying or supporting candidates. If Janus prevails, the Supreme Court would rule that all union activities constitute political speech, making it unconstitutional to charge compulsory dues. This would reduce the revenue that unions use to negotiate job matters like fair pay, access to healthcare and retirement benefits, even though they would still be required to do this on behalf of all teachers. Public sector workers, which include teachers, would have to actively opt in to join a union. In addition to losing members, their dues and the fair-share fees of non-members, unions may have the added expense of collecting dues no longer automatically deducted from paychecks, thereby further draining resources used for providing services to teachers.